MY WINDOWED ENGINE COVERS ARE BACK! MACHINED FROM THE BEST MATERIALS AND WELDED TO THE HIGHEST QUALITY THESE ARE THE BEST AVAILABLE. 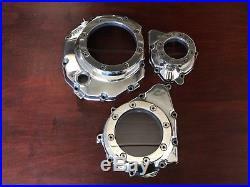 THIS LISTING IS FOR THE FULL SET OF THREE FOR AN OIL COOLED BANDIT OR GSXR ENGINE. PLEASE STATE ENGINE SIZE AND YEAR WHEN ORDERING. IF YOU NEED ANYTHING PLEASE GET IN TOUCH AND ID BE HAPPY TO HELP. The item "WINDOWED ENGINE COVERS, CHOP, CHOPPER, CUSTOM, STREETFIGHTER, BANDIT, GSXR" is in sale since Thursday, March 29, 2018. This item is in the category "Vehicle Parts & Accessories\Motorcycle Parts\Other Motorcycle Parts". The seller is "coba_valley_cycles" and is located in Helston, Cornwall. This item can be shipped worldwide.